A Gold Line test train leaving the current terminus at Sierra Madre Villa and headed toward Arcadia in the median of the 210 freeway. Photo: Foothill Gold Line Construction Authority. And officials have already begun advocating for a plan, backed by L.A. Mayor Eric Garcetti, to push the line farther inland, to the San Bernardino County border. Garcetti has said this previously, but it’s interesting to hear again given that Metro is now much deeper into the process of updating its long-range plan along with a potential sales tax ballot measure in 2016 to help pay for projects, such as a Gold Line extension east of Azusa. More on the long-range plan update and ballot measure here — and a related item below, this involving an extension of the Crenshaw/LAX Line. A test train at Denver International Airport earlier this year. Photo: RTD. Thursday was a big day for rail announcements in the West. 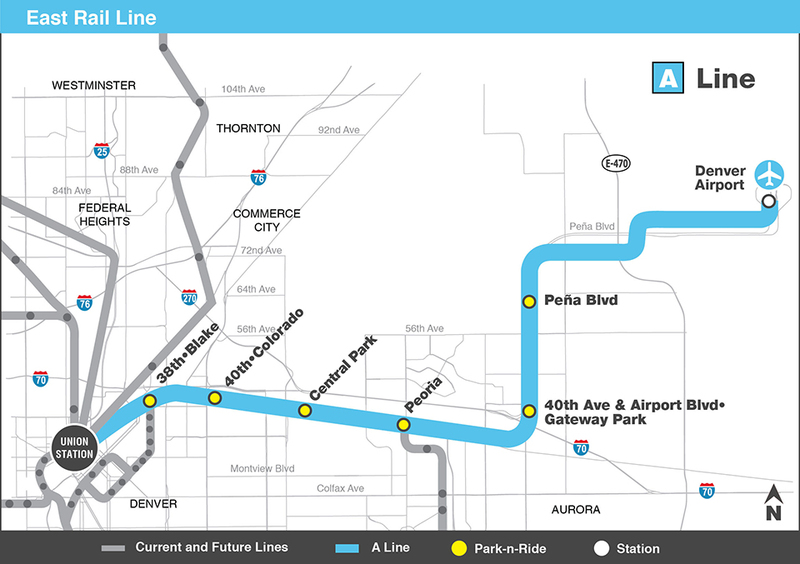 In L.A., Metro announced Gold Line service to Azusa will begin March 5 while in Denver, the new 22-mile rail line to the airport will open on April 22. Obviously, the eastern U.S. boasts most of the country’s really big transit networks but it’s been impressive that in the past 30 years cities such as L.A., Denver, Portland, Seattle, San Diego and Phoenix are turning to rail — and have made serious progress. The RTD University of Colorado A Line takes its name as a result of the first sponsorship through RTD’s naming rights program. The line is 23 miles of new electric commuter rail, which is part of the Eagle P3 project, the nation’s first full public-private partnership for transit. Local RTD taxes combined with a $1.03 billion federal grant and $450 million from Denver Transit Partners, the 34-year concessionaire that will build, operate and maintain the trains, make up the $2.2 billion project. The rail line is not light rail. It’s a commuter rail line and can travel up to 79 miles per hour. For those not familiar with Denver, the old airport — Stapleton — was close to downtown but was very small and worn out. The new airport, conversely, is very nice and also very way out on the prairies east of town. 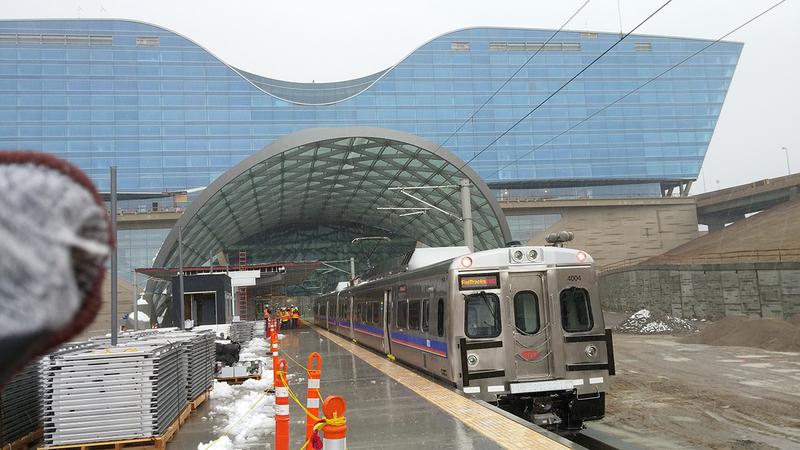 It will take the train 37 minutes to run from Union Station to DIA with service every 15 minutes between 6 a.m. and 8 p.m. and every 30 minutes between 3 a.m. and 6 a.m. and 8 p.m. and 1 a.m. More here on the project, which is part of the sales tax increase package of transit projects approved by Denver area voters in 2004. Of course, Metro CEO Phil Washington — who started here in May — was for years the CEO of the RTD. He also brought with him several executives and recently hired a Chief Innovation Officer who has a deep background in transportation funding. Bigger picture: There’s either existing rail service or will be rail service to most of the major airports in the Western U.S. For those new to the game, Metro is building an additional station on the Crenshaw/LAX Line at Aviation/96th that will allow riders to transfer to a people mover that LAX will build; the people mover will have three stations near airport terminals and also serve a new ground transportation center and consolidated rental car center, according to airport officials. The Crenshaw/LAX Line will offer connections to the Expo Line and the Green Line. Attentive readers know that Metro is looking at updating its long-range plan and a potential sales tax ballot measure in 2016 to fund projects. 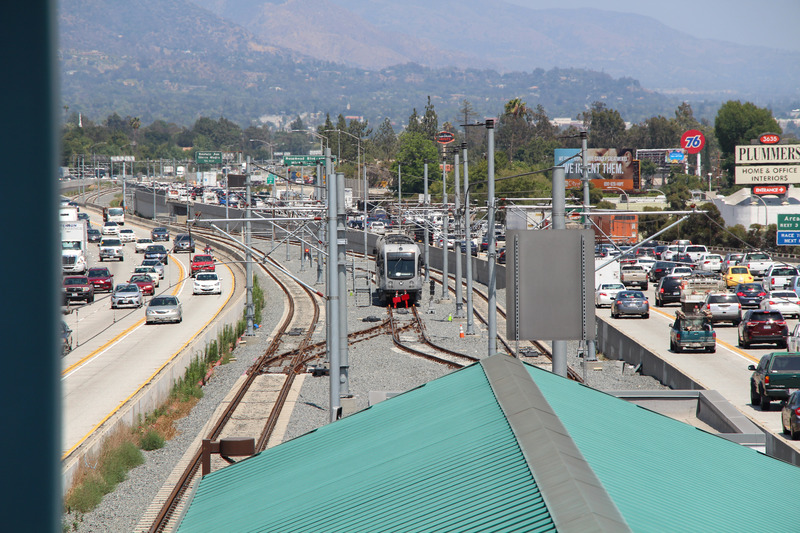 As part of that process, local cities in L.A. County have expressed interest thus far in extending the Crenshaw/LAX Line to the north to a connecting with the subway and there has been talk about extending the Green Line to the east to connect to Metrolink in Norwalk. Nothing is firm yet, but such projects would certainly make it easier to get to LAX. Again, more on the long-range plan update and potential ballot measure here. Work will soon resume on the tunnel in DTSEA. Photo: Washington Department of Transportation. The resumption of tunneling for a new road tunnel in downtown Seattle is now set to resume in late December — a month later than originally thought. The tunneling machine (aka Bertha) broke down in 2013, thereby delaying the project to move the Alaskan Way Viaduct from a waterfront bridge to a tunnel. Shocker, but lawyers have also gotten involved with the state transportation department and the contractor soon to be sparring in the courts. The most recent extension of a federal multi-year transpo funding bill (it also funds transit projects, btw) expires next week. Congress has a choice: either pass a new bill or keep extending the most recent one from 2014. The House and Senate have passed their own versions of the bill, but the pols can’t agree how to reconcile them. One problem is that most in D.C. want to avoid raising the federal gas tax to help fund these type of programs — the federal gas tax was last raised back in 1993. Tough traffic in DT Oslo circa 2009. Photo by Dion Hinchcliffe, via Flickr creative commons. Two political parties say the ban would help the country reduce greenhouse gas emissions. No details are available yet, but it’s interesting that city centre only has about 1,000 residents and 90,000 jobs, according to the Guardian. Quasi-related: Speaking of Norway, I recently finished Karl Ove Knausgaard’s “My Struggle: Book One.” It’s insightful, clever, funny, sad, deeply confessional — and kept me good company on transit. Things to listen to while sitting/standing/stuck on transit and/or the freeway: Judge John Hodgman considers whether the plaintiff’s father — who has suffered hearing loss but is extremely stubborn and funny — must get a hearing aid. A high-quality JJHo episode that is almost as tearfully hilarious as the one featuring yours truly. HWR Super Bowl Predication Update: Our selections, the Patriots and Packers, are a combined 11-0. Our unofficial second-favorite team, the Bengals, are 6-0. We said we’d be rooting for the Bills this season — mostly out of sympathy — but they’ve been so woefully coached so we are turncoating and pulling for the Jags in London on Sunday to teach Rex Ryan a lesson. But nothing the Bills have done is as criminal as what the Santa Clara 49ers did last night when they repeatedly punted in the fourth quarter at home while down by three scores to their arch-rivals, the Seahawks (“I was trying to get the field position changed,” explained their coach, who added he wasn’t giving up). NFL owners are again discussion putting a team in L.A next week. Even if the team plays in a stadium that won’t get intimate with transit, HWR will enthusiastically root for the new L.A. team to absolutely destroy the 49ers. Go Raiders, Go Chargers, Go Rams! Artwork at Metro HQ turns 20! In other news, when I arrived in Chicago last month, at the start of my fall vacation, I got off the aircraft, and WALKED, following the signs, to the Blue Line “L” subway station (right inside the terminal building, even better than Boston’s Logan Airport), made a connection (with a direct platform-to-platform elevator) at Clark/Lake, rode two blocks to State/Lake, and trundled my bags the remaining third of a mile to my hotel. And it would have been just as quick and easy to have skipped the connection at Clark/Lake, and hoofed it all the way from Clark/Lake to the hotel. Too bad our Crenshaw/LAX line doesn’t directly serve LAX. Or Downtown. I honestly don’t see why the fuss is of having a direct airport connection. There has been a lot of talk about the LAX people mover. When is LAX going to make public when they intend to start building the system? At the Board meeting yesterday one of the Directors requested that LAX officials provide a presentation on the project at an upcoming Board meeting. I’m guessing that they will answer some of those questions then. One thing to keep in mind: I believe the people mover project still needs to cleared environmentally, meaning there are some studies that will have to be done before the project is put out to bid and construction can begin. What is the projected ridership numbers for the Gold Line to the San Bernardino County border? If the ridership numbers aren’t there will METRO be able to get Federal Transportation funding? Is Norwalk on board to extend the Green Line to extending the Green Line to Metrolink in Norwalk? The last I read the City of Norwalk wanted to line underground and Metro didn’t think the cost was worth the mile going underground was worth it. It makes a lot of sense to extend the line especially since the CA bullet train might stop at the Norwalk/ Santa Fe Metrolink station. If the Gold Line eastside extension goes to Whittier, turn it south and have it go to the Green line at the 605. Extend the Green Line/Crenshaw line through the South Bay and have it meet the Blue Line. Have the Crenshaw extend up to the Red Line in Hollywood. With the Santa Ana Branch line hitting the Green Line too, now we are rolling. And the SFV line through the Sepulveda Pass down to Green/Crenshaw. The projected ridership in the Azusa to Montclair segment is 17,800 boardings per day, according to the project’s FEIR. Remember: at this time the project is not funded. If it were to get local funding, I don’t know if Metro would pursue federal funding for this particular project. As you know, some of Metro’s projects are fully funded at the local level while others receive some local funding and some federal funding. Ridership is not the only criteria for federal New Starts money. As for the Green Line to Norwalk, the Gateway Cities Council of Governments — which includes Norwalk — put the project on their draft list of projects to get funding from a potential ballot measure. The project would require a full-blown environmental study, meaning that we’re way ahead of the point in which a decision would be made about the route. Keep in mind that the COGs still need to finalize their lists of projects for potential ballot measure funding. This is great news. I hope that Metro also adjusts some of the northbound/southbound buses that could connect to the Gold Line in Monrovia, Duarte and other stations. Perhaps even an express bus similar to the 762 might enhance travel in this area. It is also good to see that college students, as well as business commuters, will get a new travel option.